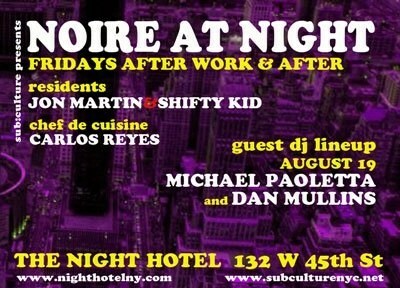 NOIRE – the Friday night after-work-and-after soiree hosted by music & nightlife industry veterans and sub:culture cohorts Shifty Kid and Jon Martin – continues to foray into the funky, rhythmic and soulful this Friday night at the sultry Night Hotel. The party features classic and bizarre film selections from Blaxploitation to Fellini, a delicious menu of light fare and desserts by Chef De Cuisine Carlos Reyes, and a full nigh…t of musical delicacies from the hosts and their guests. This week, NOIRE is proud to welcome industry veteran Michael Paoletta, “Son of Sound” producer/DJ Henry Maldonado and “The Music Gourmandizer” Dan Mullins, each bringing their own distinct musical gems to share with the most diverse and beautiful crowd in the city. As a journalist and editor, Michael Paoletta has been part of the music and entertainment industry since the late-’80s. Joining Billboard in 1998, Michael served as Dance/Electronic Music Editor and coordinated Billboard’s Dance/Electronic Music Summit. In 2007, Michael waved goodbye to Billboard and accepted a position with Omnicom-owned music and entertainment marketing agency, GMR Entertainment. Two years later, he joined Comma Music and currently serves there in the capacity of Executive Producer. The Music Gourmandizer takes a bird’s eye look at the world of music with the philosophy that if one enjoys a piece of music enough, they will certainly find a way to dance to it. With that philosophy in mind, he considers all music to be dance music. He forges the surrealism of Studio 54 with the grit of CBGB OMFUG. This idea of urban-chic encompasses disco, new wave, soul, funk, electro, italo, jazz and who knows what else – but who cares really? For Dan Mullins, good music is good music. Mention Henry Maldonado as a contributor to the early New York House scene and the statement is sure to be met with both acknowledgment and inquiry. However a quick Discog search will immediately associate him with his House 2 House, Urban Rhythm, Rhythm Section and various other aliases during House Music’s run in the 1990s. Releases on seminal House labels Strictly Rhythm, King Street, Henry Street and MAW Records would set the stage for his current Nu-Disco imprint Speak Recordings. Speak boasts a catalog of releases that includes Nu-disco royalty In Flagranti, Nick Chacona, Michoacan, Drrtyhaze, Stevie Kotey, Dean Meredith and his own Son of Sound releases. His recent pop / nu-disco venture under Native Underground enlists the talents of singer & partner Javi (Javi Silva). Together as Native Underground, the duo creates an aesthetic that’s best described as a modernized, pop-disco nod to proto-freestyle and post-disco era song writers such as John Rocca, Chaz Jenkal, Arthur Baker, Peter Brown, John Robbie, Tee Scott and others. Native Undergound’s first EP entitled ‘Till It Hurts was released in late 2010 on Roy Dank’s The Wurst Music Co., and continues to break ground, setting the stage for more quality releases from this seasoned veteran of dance-floor music.